Listed here are the main competitions of the year that CUDT and CURnR enter and a few of the open competitions where CDC dancers have sometimes competed. See also other online listings, such as the Inter Varsity Dance Association, Dance News and World DanceSport Federation. Details about the ICTM - the final competition of Cuppers which sees the colleges pitted against each other in each of the waltz, quickstep, cha cha cha and jive dances. Questions and their answers to do with Cuppers-related things. The excitement and atmosphere of a competition has to be experienced first-hand but this guide should give you a general idea of what you can expect. However, all competitions are slightly different and specific details relating to individual competitions will be given to you at the Sunday team meeting in Parkside gym prior to the competition. Most competitions have the same basic format with open events during the day, where couples represent themselves, followed by the team match in the evening, where couples represent Cambridge University. The order for the open competitions is traditionally modern followed by latin in the afternoon. Not all competitions feature Rock 'n' Roll categories, and if they do, these are separate from the ballroom and latin events, typically consisting of one round followed by the final, or for larger competitions such as IVDC anything up to 5 rounds before the final takes place. There is no team match for Rock 'n' Roll. Open events are separated into categories based on ability with Beginners (for those who have not received professional dancesport tuition before the previous IVDC), Novice, Intermediates and Advanced. Some events may have up to 100 entries. Couples will be put into heats and then the judges will select a certain number of couples to be recalled into the next round. This will continue for several rounds until the number of couples is reduced to the top six or seven for the final. The highlight of the day is the Team Match in which our couples compete for Cambridge University. CUDT is represented by its A, B, C and D teams at SUDC and IVDC, but may field more at the other competitions when the rules permit. 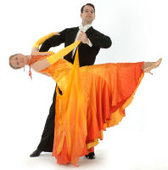 Each team has four couples, with each couple dancing either Waltz, Quickstep, Cha Cha or Jive. The team captain and coaches will advise you on which dance you will be performing. The exact format of the team match is different for different competitions, but all will be explained at the team meeting prior to the competition. At Varsity things change once again. If you have earned a place on the Varsity team you will be advised on the special Varsity format but be aware... you must compete in all four team dances! Don't panic if you go wrong, go off time, or hit another couple; stop and start again. If you crash, it is better to take a couple of seconds to regain a good hold/position before restarting than to start in a rush from a bad position. Avoid hitting other couples but, in the event of an accident, it is always good manners to apologise and help the couple up if you knock them over. Judges see you when you walk on and off the floor as well; so maintain the confident look. If you have a disagreement with your partner, save the argument until you're off the floor and out of sight of the judges. Look up, smile and enjoy yourself! If you're tired or having a bad day, don't let it show.